February 2, 2018, was a historic day in the markets, for reasons that are still unclear. It was the day that the Dow Jones Industrial Average dropped 665.75 points. And that was just the start; the bleeding from that Friday carried into the next week, and that’s when things got really ugly. Next Monday, February 5, was the largest point drop in Dow history: 1,175.21. The Thursday of that week saw another 1,000-plus-point drop. Keep in mind that there had never been a 1,000-point drop in the Dow at any point in history before that week. When investors woke up the morning of Friday, February 2, I’d bet they didn’t expect it to be the start of one of the worst drops in Dow history. And that’s because there was no reason for it to happen; it just did. Initial selling led to more selling, which led to emotion-driven, classic panic selling, and the extreme rally to start the year was completely gone in just a week’s time. But when emotions run high, it’s always the best time for a reality check. Believe it or not, the economy is fine. You wouldn’t know it by looking at the market this year, but there’s no reason that the February sell-off should have happened. Sure, an occasional market correction is healthy every couple of years. But two 4% drops in a week is normally the result of a recession, or some equally catastrophic event rocking the market down. Instead, what we’re seeing now is investors assuming the worst-case scenario in whatever may be the news headlines for that day. The chart above shows the level of optimism of large-cap CEOs every quarter since Q4 2002. 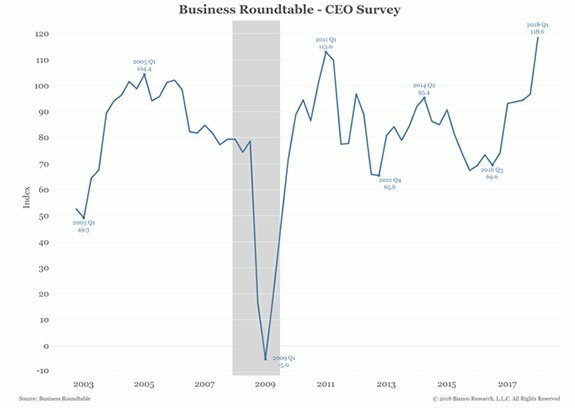 The first quarter of 2018, during which 137 CEOs were surveyed, drew the highest reading since the poll began over 15 years ago. It’s probably no coincidence that this high level of optimism is in conjunction with the new tax bill. Released in 2017, the tax bill cut the tax on corporate income from 35% to 21%, significantly helping companies in just about every type of business possible. That means that companies will be able to keep more of the money they make. Obviously, that’s good for business, and one major expectation is that they will be able to expand by using that money to buy property, factories, inventory or even smaller businesses. The other expectation is that they will use the boost in income to hire more workers. Clearly, management is looking forward to a future with less taxes, and we can expect to see a pickup in expansion going forward. I believe that this coming earnings season, which starts in just a couple weeks, we’ll be hearing a lot about companies spending money to grow. A bright future isn’t just the view of the big businesses of America. Here, we see that small businesses are also extremely optimistic. 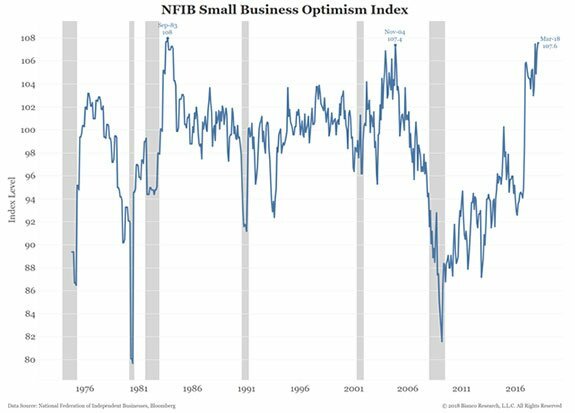 In fact, the first quarter of 2018 was a record high for small-business optimism as well. And the tax bill plays a key role here, too. For the first time in 13 years, taxes were at the very bottom of the list of problems for small businesses. One of the huge benefits that the new tax bill brings to small businesses is the reduction of taxable business income by 20%. So, if a company made $100,000 in operating income, they’d be able to take $20,000 off the tax bill and only be taxed on $80,000. That’s a huge amount of money that these small companies will be able to put toward growth, which, of course, is the primary objective for small businesses. 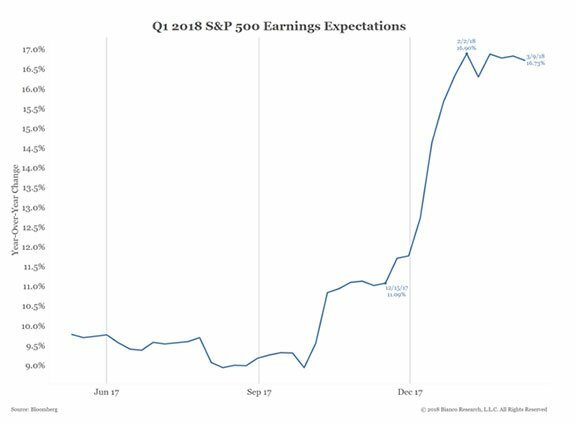 Another way to gauge market optimism is by looking at expectations for corporate earnings, or profits. Right now, Wall Street is expecting big things for the start of 2018, projecting an increase of almost 17% over last year’s first-quarter earnings. And those earnings, by the way, were 16% higher than the year before it. 17% growth for an entire index in a year is great, and would continue the impressive run that the market has made since posting seven straight quarters of negative earnings growth in 2015 to 2016. The rebound from that trough is just another signal of a strengthening economy. The spike in the chart above from 11% to 17% was a result of the aforementioned tax bill being passed in December. Because taxes are the last cost that companies face before their bottom-line profits, that tax bill will directly affect corporate profits in a very good way. So far, we have optimism on the overall state of the economy from management of both large and small businesses, and optimism from Wall Street. All that’s left is the everyday consumer. The consumer is the most important part of the economy. There are four components of gross domestic product (GDP), which measures any given economy: consumer spending, business investment, government spending and net exports. 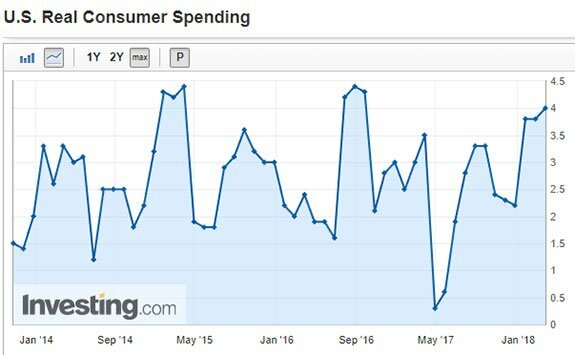 However, in the United States, consumer spending generally contributes about two-thirds of GDP. So, it’s not really debatable that it’s crucial for people to spend money for the economy to run smoothly. And not surprisingly, the growth is there for consumers as well. The most recent reading you’ll see on that chart is 4%, and that’s for Q4 2017. It’s also the highest since Q2 2016, and one of the main reasons we’ve seen increasing GDP growth for six straight quarters. 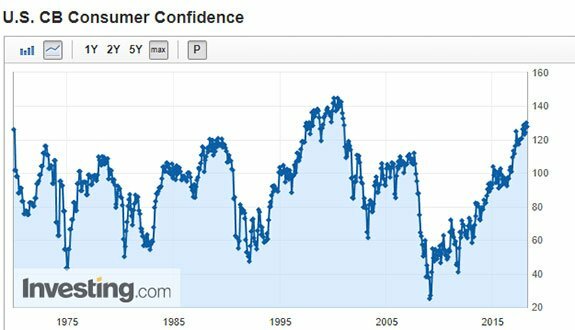 And if that wasn’t enough, we’re also seeing confidence in the economy at levels not seen in about 20 years. The index, which is run by the Conference Board, tracks overall sentiment from households across the country, surveying them on items such as business conditions and employment. What this growth means is that the amount of people who think business conditions are good and jobs are plentiful is going up, while the number of people who think business conditions are bad and jobs are hard to get is going down. More people also expect wages and overall employment to grow, which suggests that more people will have more money to spend. For a market that looks shaky, there’s certainly a lot out there to be optimistic about. Based on the hard data that we have, management, analysts and consumers (pretty much everyone) all think the economy is great. Companies are growing, and they’ll continue to grow based on taxes, which means higher employment, which means more spending, which drives the economy. And with earnings season coming up, we’ll see just how well that tax bill is already improving companies’ bottom lines. That will surely be the focus for the next couple of months.